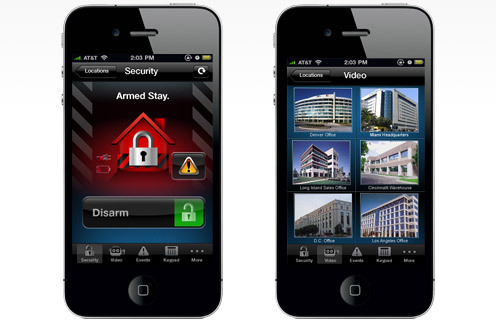 With the tap of a finger Honeywell's Total Connect apps let you control your security Los Angeles Cameras and alarm system, receive text messages and e-mail alerts—even view live video, event-driven video clips and pictures on your iPhone®, iPad®, iPod touch®, BlackBerry® or Android™ devices. * What could be more appealing than that? BlackBerry and Android Total Connect 2.0 Apps coming soon! At the heart of Total Connect is the unique virtual keypad, which can be accessed via a secure website. Whether at home, in the office or on the road, your residential and commercial customers can control their systems via PC’s, compatible PDAs, web-enabled cell phones and more to stay connected to their businesses. Offered only by Honeywell, the virtual keypad is an online version of an actual keypad – making it easy for users to control their security system and initiate real-time changes. *Requires a Honeywell Security System and Total Connect subscription. Get your free Total Connect app today! Download for iPhone, or iPad available now in Apple's iTunes® App StoreSM. BlackBerry and Android Total Connect 2.0 Apps coming soon! Get your free Total Connect app today! Download for iPhone, or iPad available now in Apple's iTunes® App StoreSM. BlackBerry version accessible to Total Connect subscribers when logging on to their accounts. Android smartphone users can visit Android Market. iPhone®, iPad™ and iPod touch® are registered trademarks of Apple Inc. All other trademarks are properties of their respective owners.